For those who are into the hobby of motorcycle riding, they are well aware of the type of safety equipment that is needed to keep them safe. Some of these important items are their clothing. For example, leather chaps and jackets can protect against the weather and help reduce injury if there happens to be a spill. Out of all the safety equipment that can be chosen for motorcycle riding perhaps it is the motorcycle helmet that is going to be considered to be the most important and the most protective. These are an item that are well worth investing in so a lot of people don’t mind spending the extra money and making sure they get a good quality helmet. Motorcycle riders have to be a certain age in order to be able to ride a motorcycle legally. These individuals have the ability to set a great example for children who are riding other types of bikes and motorized transportation. When the children see the motorcyclists wearing motorcycle helmets for their own safety then they will often do the same. There are specific helmets for kids that can be purchased that are designed for their size and safety. 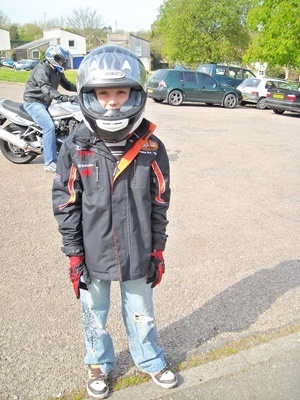 When they get into the habit of wearing these at a young age they are far more apt to continue with this important habit when they become motorcycle riders. There is no need to throw away old motorcycle helmets. They can be handed over to the craftsperson who no doubt with their creativity will come up with some really unique ideas as to how to recycle these items. They can be converted into some really neat looking planters. They just need to be turned upside down where the headpiece is used to retain the soil. Then almost any short rooted plant can be used as the foliage. Creeping plants can be used so they will trail down and out the front piece of the helmet. In this case, the helmet can be hung on a wall or an outdoor fence so the flowers can trail downwards. Another neat idea for refurbishing a motorcycle helmet is to turn it into a lamp. The helmet gets attached to a square base. Then a hole is drilled through the top of the helmet to hold the rod of the lamp. Whenever you are going to recycle the helmet for a craft use where the finished product is going to be used outdoors you may want to line the inside of the helmet with plastic to help preserve the lining.